Mom and baby yoga classes provide an opportunity to regain strength and flexibility, to bond with your baby and to connect with other moms. The eight-week spring session of Harmony Souls Mom and Baby Yoga begins Friday, April 23. Classes are held from 10 to 11 a.m. each Friday through June 11 at Sanctuary House on the corner of Eastlake Avenue and Main Street. You don't have to have had yoga experience before this. But, if you have practiced yoga before, you may find these classes are a great way to transition back into pre-pregancy practice. 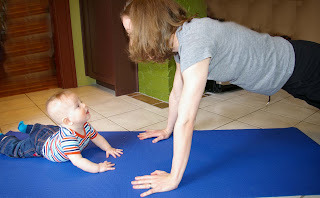 You can expect stability-building poses, core strengthening movements, tension-relieving breathing techniques and opportunities for baby massage. "This is a special class," said Harmony Souls owner and local mom Chantal Banda. "We often share experiences from our week during the class, which helps form a close-knit community of moms. Many of them meet for walks or coffee at other times during the week. It can be a great network for new moms, and I enjoy offering this class for that reason." While pre-crawling babies are at the perfect stage for these classes, Harmony Souls welcomes crawlers and new walkers. Moms are encouraged to meet the needs of the child first and foremost, and breastfeeding is always welcome. New drop-in students are invited to try the first class for $5. If you are interested in registering for the full session, click here and scroll to the bottom.